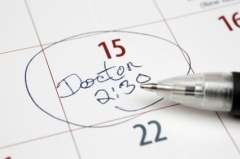 We operate an open access appointment system for booking doctors' appointments. Please telephone the surgery from 08:15 onwards on the day you wish to be seen. You may also book appointments online with Patient Access via the link at the top of this page. Click here to find out how to register for this service. If you are requesting an on-the-day appointment with a doctor, please call before 10.30 and your request will be triaged (assessed) by a doctor who will call you back before 10.30 and, if appropriate, you will then be offered a 10 minute appointment, subject to availability. We also offer a limited number of pre-bookable appointments up to 2 months in advance. The numbers are limited so as to allow the maximum number of triaged appointments to be seen. We understand that for some patients the above may not be possible due to work commitments or transport difficulties. For this we provide a pre-bookable appointment service which allows you to book in advance. We operate a pre-bookable appointment book between 17:00. and 18:00 on Mondays and each doctor has two or three such appointment slots allocated to them daily. Should you opt for a pre-bookable appointment please ensure that you attend. In the event that you find you are unable to attend, please telephone and cancel the appointment so that it can be offered to another patient. This ensures the maintenance of a smooth running appointment system that will benefit all patients. We have a number of appointment slots allocated to walk in patients first thing every morning between 08:30 - 09:00, These are given on a first come, first serve basis and available to every patient. If you feel that your problem does not require a 'face to face' consultation, you can request a telephone consultation. A time will be given to you when the Doctor will telephone you and you will be asked for a telephone number where you can be contacted at that time. If, However, the Doctor feels that you need to be seen, then you will be given an appointment later on during the day. This is service is offered every afternoon and is for emergencies ONLY. If you are unsure whether you require an emergency appointment then please ask for advice. The afternoon emergency appointments are available to see patients who have a problem which requires URGENT attention. These appointments are not to be used as a means of obtaining a routine appointment when the appointment book is full, nor are they to be used to obtain repeat prescriptions for ongoing conditions. Please only request such a consultation if your condition is such that it requires attention that day. Patients attending emergency surgeries with non-urgent conditions place severe stress on our resources. The doctor may decline to see any patient who presents at the surgery who has not followed these guidelines. Such patients may be told to book a routine appointment the following day.